Caleb was fortunate to grow up in the art colony of Rockport, Massachusetts, where he began drawing at age four, painting at seven, and attending professional artists’ workshops by the time he was twelve. After graduating from Kennebunk High School in 1985, he enrolled at the Lyme Academy of Fine Arts which he attended through the spring of 1990. Working primarily in oil, but also in watercolor and pastel, Caleb is a representational-impressionist painter focusing on New England landscapes and marine scenes. 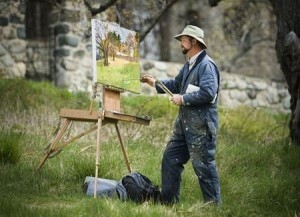 He is the recipient of numerous awards, including the John Stobart Fellowship Award, the New England Heritage Award-Oil, the Wood Award for Excellence in Watercolor, and the Gold Medal Award for the Land and Light Show at the Bryan Memorial Gallery in Jeffersonville, VT. His workshops are offered throughout the year nation-wide, including Monhegan Island, Cape Ann, and Alaska.